Legend has it that Buddhist monks discovered goji berries hundreds of years ago when they were roaming the Tibetan mountains. The ones who found them first and ate them, and those who later incorporated them into their daily diet, supposedly lived longer than those who didn't. Goji berries have since had a reputation for delaying mortality. We don't have any reputable studies saying they actually work, but we do know that berries are antioxidant powerhouses and are full of nutrients, amino acids, carotenoids, and polysaccharides that make this ingredient a no-brainer for anti-aging skin formulas. 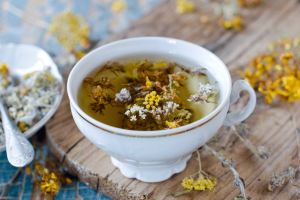 This ancient Ayurvedic remedy may help fade your age spots. 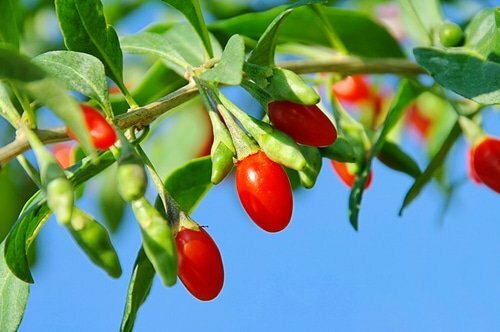 The goji berry plant is also known as the “wolfberry” plant, and is a woody shrub native to Asia, particularly China. Botanically called “Lycium barbarum,” the plant species is in the same family as the potato, tomato, eggplant, nightshade and tobacco. They prefer well-drained soil of moderate quality, and have an extensive root system that resists drought conditions once established. They like full sun. Leaves are egg-like, with blunted or round tips. The flowers grow in groups of one to three, are trumpet-shaped, purple or white, and bloom from June through September. Fruits are bright orange-red, elliptical-shaped berries that have anywhere between 10-60 tiny yellow seeds inside. They ripen July and October, but as they spoil easily, they have to be harvested very carefully. They're said to have a sweet and slightly tart flavor—a combination of cranberries and cherries—and are often preferred dried and cooked. The goji berry's reputed ability to help preserve long life was recorded in China's first herbal encyclopedia, “Shen Nong's Materia Medica,” written in the first century B.C. The goji was classified as a “superior tonic,” in a class of herbs that people should take on an ongoing basis to preserve youth and promote general well being of life. Note: Goji berries have some anti-coagulant properties, so it may be best not to combine them with blood-thinning drugs. Amino Acids. Amino acids, at their essence can help smooth the look of your skin, and improve tone and color. They also help improve skin hydration. Best of all, they're non-irritating. Add all these properties together and you have a powerful anti-aging ingredient that works on a number of different levels. This is a great example of why we like using natural ingredients. Most synthetic and chemical ingredients provide one or two benefits at most. Natural ingredients, on the other hand, deliver several benefits all at once, and because they're presented in their natural form, tend to work better with the body's own systems so you see faster and longer-lasting results. We use goji berries in the following products for their anti-aging and protective properties. Do you incorporate goji berries into your daily diet? Please share your thoughts. Do you have a full ingredient list available? Please confirm about the Goji Anti-Age Cream? I saw lots of pics with different print please send me the genuine and authorized picture, Also please confirm if I can order here for it then please reply me the delivery charges and cream price. Thank You. I would like receive information about this product ANTI-AGING EYE CREAM or HERBAL FACIAL OIL FOR NORMAL AND COMBINATION SKIN. I know that this product is produced in China. It is possible send to me a Restore Sample Kit for Mature or Dry Skin. I live in Curitiba in Southern Brazil.